I woke up just after first light and made a quick trip to the bathroom. I planned to watch the sunrise behind the waterhole. As I came out from behind our hut, I almost bumped into a hyena! I skidded to a halt and whispered a word that rimes with luck;-). The hyena and I stood there looking at each other for a few moments, both not sure what to do. Ehm, good morning…?” I muttered. Not sure if that is a proper way to greet a hyena, but it was the only thing that came to mind, haha! The sound of my voice snapped the hyena out of his indecisiveness and he spun around and ran away as fast as his feet would carry him! He stopped a distance away and looked back at me. I could almost see him think: you did nót just say that to me! It was comical and a bit scary all at once. I woke up Steven as I wanted the hyena out of camp before any of the children were up and about. Luckily, by the time we were both at the fence, the hyena had made its way out of camp and was drinking from the waterhole. There were lots of hyenas around still this early in the morning. Several came to have a drink, but they eventually disappeared when the presence of a couple of buffalo became too much for them. And then, all of a sudden I heard the sound I have been anticipating for a couple of weeks now. Still croaky, raspy and a bit out of tune, but there it was: the sound of the Woodlands Kingfisher! How awesome! Welcome back beautiful colourful birds! We had such a lovely chilled out day in camp. The children were exploring the camp and the huts; they played games under the lapa and took turns sitting quietly by the fence watching the animals. During the heat of the day, they played in the skulpie pool I had brought and after making a couple of mud pies; they also decided that a mud bath would also be fun! So after a while, Aiden and Jack looked like a couple of daga boys! Weather was building up all around us. In the south, we could see big dark blue clouds gathering. The bush went quiet in anticipation, the heat pressing down. Not even the birds were making a sound; could we possibly get some much-needed rain? Well, we did! That evening, after a few little drops here and here, the heavens opened just as I was carrying Jack to bed. The short walk back to the lapa soaked me from head to toe! The carefully swept paths in the trails camp turned into mini rivers. Frogs were croaking with excitement and gratitude. The trails camp received 11.5 mm that night! I listened to the rain drip from the trees after I climbed into bed. Then, just before I fell asleep, a male lion started roaring close by. That sound vibrating through the air must be one of my favourite sounds of the bush. It just screams Africa! The next morning I sat at the fence as the sun came over the ridge. The waterhole was quiet as the bush now probably had pools of water all around. From an overhanging tree branch, winged termites were taking to the air. They were flowing from the tree like little alien spaceships swarming out to colonize the universe! And in the soft morning light, it was a fascinating thing to see! We slowly packed up camp to head home. A few hundred meters out of camp on the road running parallel to the waterhole, we found male lion tracks! They were huge and must have been from the same lion we heard the night before. An awesome way to end a fantastic weekend in the bush! But check out the size of this track! It all sounds so perfect! What a lovely weekend – even the hyaena in retrospect is a great part of the whole although having come face to face with one on a couple of scary occasions I fully respect your caution! Loved your depiction of the termites taking off. Thanks so much for once again sharing a very special bush experience. Thank you, Sal! I would not have missed it for the world! Hyena encounter and all! Haha, thank you, Liza! Lol, I have to admit, I had some fun writing this one too. What an brilliant account of your experience on this trail. Thank you so much, Darryl! Glad you enjoy reading them! Have a lovely weekend! Sounds wonderful and the rain plus the woodie call the cherry on the top! Thank you so much Linda for your delightful posts, many years ago my husband and I did the Wolhuter trail and thoroughly enjoyed it, this post brought back lovely memories . Thank you Linda for your wonderful blogs. You really make me wish I could be in your shoes living in KNP and enjoying such wonderful nights in the bush. Wow that Lion roaring in the night is nearly as exciting as hearing a Leopard “sawing” as I did this week ! What huge footprints that Lion left !! Hi Mavis! That leopard sounds exciting! Hope you got to see him the next day! We were around the Wolhuter memorial years ago – north east of Tshokwane I think? – and it was raining and raining and the only sign we saw of lion (we knew they were around as everyone else was telling about their sightings). All I have are some huge tracks in the mud along the dirt road near the memorial. Apt place I suppose given the history? Loved the story about Wolhuter going to the Joseph Rodgers shop in London. The snooty sales person just sniffed and walked away when this COLONIAL said he KNEW that JR knives were the best – one saved his life when he killed a lion with it….!! Haha, Erik, that salesperson hopefully changed their tune after hearing that! Thank you for you narrative. I was there with you. Amazing!!!!! That is a lovely compliment, Michael! Thank you! 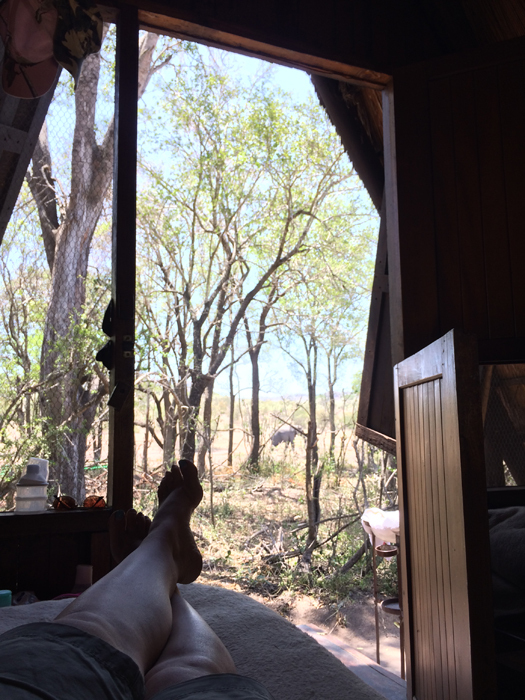 Living in the bush and being so close to nature must be so inspiring, a blank canvass if you like and then nature colours it in for you everyday….You don’t get much better than that. Priceless…The best part of your story is to know that you know that. Keep up the good work , really enjoy the stories. Hi Belinda, Thank you so very much for your lovely comment! I really appreciate it. We are very lucky to be able to live here! And even though it is challenging at times, we enjoy every second! Thank you for your lovely comment, Carmen! And for your vote too! It is highly appreciated! Have a lovely day! Linda I just love your stories. I love the Kruger and have visited it the past three years and am already looking forward to our trip in 2019. We love stopping on the bridge near Malelane gate to see how many animals and birds we can see. Please keep writing your wonderful stories. I had a yearning for Kruger this morning and it was so good to experience a bit of the magic through your eyes. Thanks so much and kuddos (or should I say Kudus – African version ) for sticking it out in the wild with a family! Lol, Kudus! Love that. Thanks, Maryke!